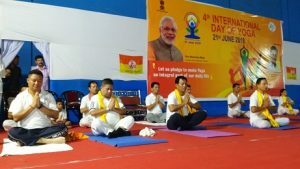 Along with the rest of the world, the International Day of Yoga was also celebrated in Kokrajhar district in a befitting manner on Thursday. The Kokrajhar district administration celebrated the day in association with Pathanjali Yog Samity, Kokrajhar at Kokrajhar District Sports Association Indoor Stadium. BTC deputy chief Kampa Borgoyary, BTC executive member Doneswar Goyary attended the programme and participated along with other dignitaries like Kokrajhar Deputy Commissioner Niranjan Baruah, SP Rajen Singh. A rally was also held as part of the programme which was flagged off by BTC executive member Doneswar Goyary. The BTC deputy chief said the yoga makes people physically strong and it helps to keep health in good condition. He said people of all walks of life should come forward to do yoga for a healthy body and mind. Meanwhile, the unit of Red Horns Division also organised an event to mark the 4th International Day of Yoga in Kokrajhar. The International Day of Yoga was celebrated at all the Army camps of Kokrajhar while one central mega event was held in the football ground at Patgaon. The event, which was well publicised prior to its celebration, was participated by more than 450 yoga enthusiasts. In total 1050 participants from entire district joined the programme and it emerged as one of the largest yoga events organised in Kokrajhar. The programme was initiated by Pradeep Kumar Borgoyari, principal, Jharbadi High School, Patgaon, who in his welcome remarks, highlighted the Indian origin of yoga, its benefits, etc. School children also participated in the yoga session that followed. The programme, which lasted for about an hour, was conducted under the supervision of a yoga teacher that included an overview of the benefits of yoga and demonstration of important asanas and postures. The programme was aimed to spread awareness of yoga in all aspects, both for the uninitiated as well as the practitioners. There was enthusiastic participation from a broad cross-section of society that included regular yoga practitioners/enthusiasts, students, prominent personalities of Kokrajhar and representatives of yoga institutes. The army collaborated with the civil administration and local schools alike. 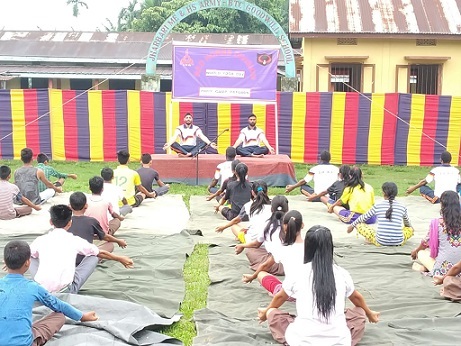 On the other hand, the Chirang Army of Red Horns Division also celebrated the 4th International Day of Yoga. The event was celebrated by all the army camps of Chirang Army. The schools which participated in the event included Panbari High School, St. Martin High School near Dongsaipara, Amteka High School near Kaila Maila, Khungring High School and Manshari ME School near Panbari.